I've had a lot of fun with this game. You can play with a less skillful opponent and it's still a very interesting challenge and a very valid exercise. You practice accuracy, shooting line and braking shooting line in the air. As if that weren't enough, you also develop accuracy with slack line casts. A real challenge. Immediate: to land your tag as close as possible to the rod sock without overshooting it or touching it. Short term, in actual fishing: to keep your line and leader from landing within the trout's window, unless that's precisely what you want to do. 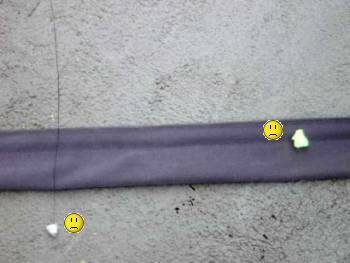 To practice accuracy: with the rod socks stretched out on the ground end to end to form a line for lagging 12 yards away, make a straight-line cast so your tag will land as close as possible to this line. Your opponent does the same. A tag that lands beyond the line or touches it automatically loses the point. The closer of the two tags gets one point. The first player to reach 25 points wins. 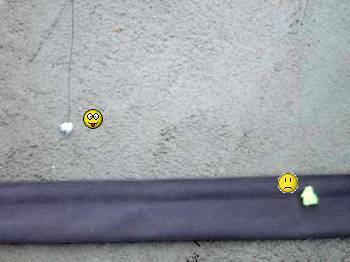 To practice shooting and braking shooting line in the air: stretch the rod socks out in the same position 15 yards away. Extend your lines on the ground to a distance of 12 yards. Mark this distance with a couple of traffic cones. Now you have to pick up and shoot line to land your tag as close as possible to the rod socks. You have to brake the shooting line at just the right instant to avoid overshooting. Play the game as explained previously. 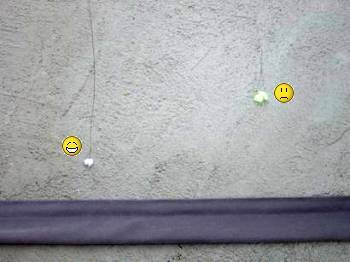 To practice accuracy with slack line: with the rod socks 12 yards away, extend your lines over and beyond them to a distance of 15 yards. Pick up and, without shortening the line in the air, try to get your tag to land as close as possible to the rod socks. As before, it mustn't touch or overshoot them. Play the game through as in the two preceding cases. Shoot the line smoothly and brake the shoot with a kid glove so it won't rebound. The best slack line cast for accuracy is the parachute. As you can imagine, you can increase the distances as much as you want. Like golf, you can play with a handicap. One player places her rod sock farther away than the other. Another option is to give three extra points for landing a tag right on the rod sock.